for a while now, i've been thinking about alternatives to dry-cleaning. longtime readers know that i've always been an advocate of buying natural fibers: cotton, silk, wool, linen. nothing irks me more than finding a beautiful garment on the rack that turns out to be 100% polyester. i will make an exception for rayon jersey now and then. but in general, nothing rivals natural textiles for quality, breathability, and feel. silk is a particular favorite and there's a lot of it in my closet. unfortunately, 99.9% of all the silk garments on the market these days are tagged 'dry clean only'. several years ago, i didn't give a second thought to dropping off a pile of clothes at my trusty dry cleaners'. recently, however, i've become more selective about buying DCO garments. obviously, the environmental/chemical toxicity of the process and its after-effects are major factors, but it's also about the cleanliness. maybe i'm old-fashioned, but i just don't feel like something is truly 'clean' unless it has gone through a sudsy washing. i doubt i'll be able to avoid dry-cleaning entirely (fine wool suits and certain very delicate garments no doubt will still require it). that said, i am very interested in budget and eco-friendly alternative methods, particularly for my silk blouses that get a lot of wear throughout the year. so i'm curious – how do you clean and care for your silks? have you had success with hand-washing / line-drying? do you use a gentle detergent (ie: Woolite), or a DIY household solution? more in this series: Mansur Gavriel vegetable tanned leather care & maintenance. Psst. Rayon is natural. It's made from wood pulp. i think it depends on if you're a textiles purist. many consider rayon to be a synthetic due to the processing method. i also find it to be a particularly finicky fabric to wash/maintain (pilling, shrinkng, etc). i do this with all my everlane shirts and some silk crepe dresses from steven alan and wiksten. after they have dried, i steam them to get all the wrinkles out. ends up as good as new. Do you find that steaming is the key to getting the original everlane texture? I tried washing with castile and air drying and found it came out crepey/more rough (still nice, but not that satin sheen, if you know what I mean?). Tried again with Forever New which is supposed to leave no residue. Same deal. Maybe I need to do a vinegar rinse to get all the residue off? Or maybe it's just the steam step I am missing? Thanks for any help you can provide! It's not residue — the texture just gets weird when you air-dry silk. You can try ironing, but it's very finnicky and easy to cause damage. Steaming is the right way to do it. A good clothing steamer can be had for $50 or less, and it'll pay for itself very quick as a substitute to dry-cleaning. I agree with you on the level of cleanliness after dry cleaning. Clothing mostly comes back with a chemical smell rather than a clean smell. Also given the frequency of hot and humid days in DC and the need to clean them regularly, coupled with the exorbitant cost of dry cleaning here, dry cleaning becomes prohibitively expensive rather quickly. I hand wash all of my silk, regardless of the tag instructions, in the bathroom sink, with Woolite. With a fresh sinkful of water for each of the following steps, I rinse out all of the suds, then dilute a very small amount of white vinegar in a sink full of water and swish the item around. I do one final rinse with clean water before I'm done. Even though I'm filling and refilling the sink a couple of times, the entire washing process takes me five minutes. For delicate silks that wrinkle, I roll in a towel to press out excess water, until I'm ready to iron, which I do while the shirt is still damp. For hardier silks, like silk noil, I just air dry. A steamer is on my wishlist (aka my wedding registry, so I'm waiting to see if someone else buys it first), at which point I would just air dry everything then use the steamer for wrinkles. I'm rather pleased with the results. I should note that all of my silk is solid colors, so I don't worry about dye running. I hand wash cold my silk shirts from J. Crew, and they shrink 1-2 sizes. So I think you have to be careful. I hand wash Hermes scarves, being careful to prevent color bleeding, and they turn out just fine. Go figure. ugh, that's really a shame. the last silk blouse i bought from jcrew three years ago was pretty shoddy fabric-wise. my guess is that has something to do with it and that's why your Hermes scarves are fine! Oh no! What style (so I know to avoid it)? I have two J. Crew silk shirts that I hand wash all the time and they've never shrunk. I have the Blythe blouse and it shrank like crazy (just threw it on my giveaway pile actually). Interestingly, I also have a silk dress from J.Crew and it's washed beautifully. The Blythe blouse - two of them! Also, one of the Blythe blouses quickly ripped in the back - the fabric literally got stress marks in a few wears and pulled apart just in the middle of the fabric. Needless to say, haven't bought anything silk from them since, but glad to hear that other silk from them holds up better. I've had the exact same issue with my Jcrew Blythe blouse as well. It got stretch marks which was strange because I had bought it slightly oversized. :( A bit relieved to hear I wasn't the only one though! First I soak my silks in tepid water with a little bit of woolite or some sort of delicate fabrics detergent. The next step is soaking them in cold water with a dash of white vinegar. I read somewhere that vinegar helps to remove the soap out of the fabric. Lastly, I run them under cold water and very carefully squeeze the water out. You really have to be really really really gentle while doing this, as silk is a very delicate fabric. When you've got most of the water out place the silks on a big towel on a flat surface (I like to use a beach towel) and let them air dry. Hope this works out for you! This is what I've done and it has always worked. Sometimes I use Eucalan, which is even more gentle & doesn't require rinsing, but I find that it doesn't get stains or real grime out. I am a very similar philosophy and I have a policy that I never thrift anything synthetic anymore.I thrift a ton of good linen because people think it has to be dry-cleaned, which couldn't be further from the truth. I love silk too but it is one of the hardest ones and I've basically given up on wearing silk while my kids are young. When I do have to wash it, I follow guidelines I read in an old sewing book on sewing with silk and immerse it in water with a wool wash (like Eucalan, never Woolite), rinse it by water immersion, and roll it between two towels gently to get out the excess water. I will nearly always iron silk from a damp state (towel dried) and that is ideal (but for some types of silk, this can change the characteristics of it so it is best to test this on a small patch or iron on the wrong side of the fabric with a pressing cloth in between). Count me as a long-time reader, first-time poster but I had to weigh in on this. I hand wash (or machine wash delicate in a mesh bag) many, many things that are marked "dry-clean only." Silk definitely! I have found very useful guidelines on the Laundress website and I have used many of their products happily. I am partial to their stain remover. (And no! I don't work for them. I just like them!) I have used and liked their delicate wash, but frankly, I prefer less smell. So now I use Soak, in its unscented formula. I find it works very well for delicates like silk. I also use it for linen and any delicate cotton pieces. For wools, I use either the Laundress or Eucalan. I follow Laundress directions for blocking and pressing, when necessary and so now I only go to the dry cleaner for suits when needed or for pressing that I just can't do myself (tiny pleats!) My dry cleaner will press without cleaning too, so if I'm happy with my cleaning job I just ask for a pressing. Not only do I not have to go to the dry cleaner as often, but I can make (sort of) snap decisions about what to wear - a silk blouse dries overnight and pressing it is a snap! I love the Laundress products too, and machine wash on "hand was" cycle in a mesh bag. Has worked perfectly. I do the same for cashmere. The Laundress website is fantastic. i wear a lot of silk tops, especially in the summer, and hand wash all of it. just a little detergent (i use seventh generation) in a basin, let it swirl around and soak for 10-15 minutes, then rinse, press out the water with a towel, and air dry. i actually find silk to be really easy to take care of. with all the sweating in the summer, somehow dry cleaning doesn't seem to keep my tops feeling fresh. i do dry clean silk pants though, and also all wool - that seems risky to try hand washing. it seems like companies put "dry clean only" only the label so they don't have to take responsibility if the directions on the label don't work out - i have a lot of shirts that totally can be thrown in the washing machine say "dry clean only". I have several silk jersey items that I'll machine wash in a mesh bag on the gentle cycle (cold water of course) and some Laundress or other liquid soap for "delicates." (Nordstrom makes a good one that I use for my lingerie as well.) I dry them on a rack or hanger, depending on the item. I do the same with my silk blouses, with good results...though I think I'd like to get a steamer to use instead of an iron. i've always had problems with tencel. it looks great new and in the store, and then i follow the care instructions and it completely warps or shrinks or falls apart after just a few washes. Machine wash on the delicate cycle in individual mesh bags, line dry, steam. Easy peasy. I use Le Blanc's Silk & Lingerie wash and hand wash in cold water (soak, agitate and rinse clean) and wrap in an old towel and gently press it to dry. I've never sent my clothes to dry clean - except maybe for my wedding dress and my husband's suits! I think handwashing works for mostly everything that you can fit into your sink or bathtub - including cashmere. First time poster here. So happy to hear that others are hand-washing the colorful everlane silks with success. I hand wash all of my wool and cashmere sweaters in the sink and also my fancier delicate t-shirts. Am going to stop taking my silks to the dry cleaners following all of the great advice given here! I use the laundress or eucalan to wash nearly everything. 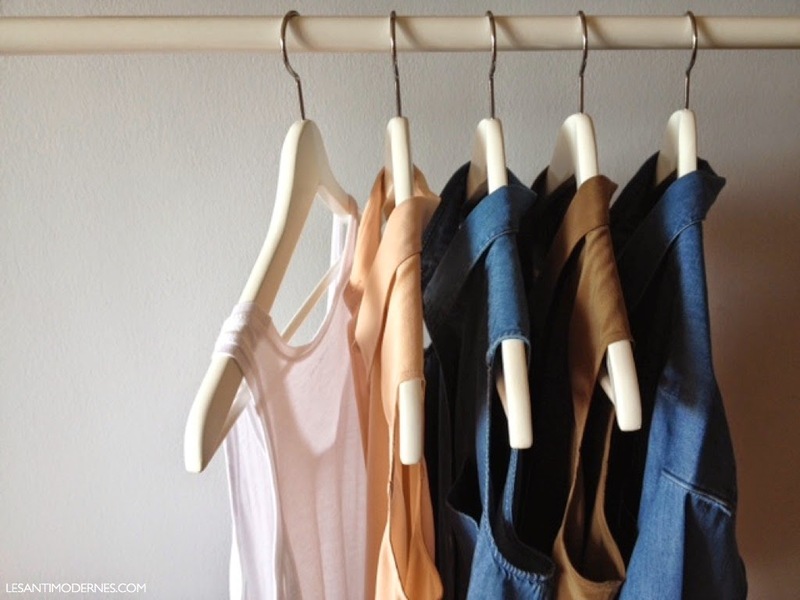 I was irritated earlier this summer when I had purchased quite a few silk, cotton, linen items from lines like Jesse Kamm and Jenni Kayne, only to find that they recommended dry cleaning for the natural fibers. What?! I dropped everything off at the dry-cleaners, and it smelt like a combination of musty chemicals when I picked them up. So I promptly hand washed everything and they turned out fine. What I don't understand is why clothing designers will recommend dry cleaning for items made of 100% linen or 100% cotton? Yep, I think the dry clean for cotton/linen is so the companies aren't at fault for shrinkage. I tend to look at the fabric instead of the label instructions unless its a fabric I'm unfamiliar with. Regardless of what the tag says anything that's 100% cotton is getting thrown in the wash on cold. I just hang dry those items in order to avoid any dryer catastrophes. I use Eucalan to hand wash, but I also hear that Soak is excellent for this as well (next on my list to try). I've had pretty good luck with Tencel, treating it like silk: delicate wash, line dry. This is going to make me into a fabric heathen, but I wash my silk shirts (e.g. Everlane and Equipment blouses) in the machine with my other clothes. I just take them out after the wash and iron them while they're still damp. This allows the blouses to have that natural silky feel (which I find lacking when I hand wash them). I've been doing this for a while and all my silks have been keeping very well! The only thing I take to the dry cleaners is my 100% wool coats. I wash my silks and cashmere in the machine on delicate cycle (mesh bag) with like colors. Then I air dry and either gently iron or put in the dryer (delicate cycle) for 3-5 minutes. It's the dryers on regular cycle that do clothes damage, not the washing as long as it gentle. I don't own any Everlane yet, but I have Equipment, BCBG, Vince Camuto, and Victoria Secret silks that have had no problem (all are solid colors). The only shirts that didn't wash well were some from Jjill that were supposed to be machine washable! Go figure. I wash my linen and cotton the same way, though I'll sometime tumble dry low (delicate) on occasion. I use Seventh Generation free and clear or Arm & Hammer dye free for sensitive skin. As for stripes, before you wash for the first time, put the piece in a bowl of cold water (cold as you can get it) filled with salt. Rinse gently, air dry. After that, wash with other striped colors only and use a color fast strip. With my silks, I hand wash in cold water with a bit of detergent but instead of squeezing out the water after I'm done washing, I just put the wet shirt on a hanger and let it air dry. This might sound a bit weird but I find that it works surprisingly well with my mulberry silk shirts and the best part is I don't need to iron them afterwards (I hate ironing!). Not sure if this method will work with the Everlane silk shirts though, I ordered a few recently and will try it out when I get them. Hey! Currently having issues getting the finish right on my everlane shirts after handwashing them. Have you had any success? Thanks! I’ve only washed silk scarves (Brooks, Pucci, and YSL) and I use water and some squirts of Purpose (aka baby shampoo) and a drop of white vinegar. And then I hung them to dry and steamed them out. Check out The Laundress website for washing tips. Though I’d take the washing a Chanel jacket with a grain of salt. Mine survived but I wouldn’t do it again. I wash silk in cold water, sometimes tepid if I feel they need a better wash, with mild liquid detergent, rinse twice, last one with a bit of vinegar and tiny drop of softener (otherwise it gets static). BTW a little important secret of mine, if you get oily stains (usually from food) rub a little rice flour into the stain, shake/brush off and voila gone! I have at various points machine-washed just about everything in my closet. Even a wool suit - though I wouldn't do this again because it took a monster amount of steaming and ironing to get the jacket back to shape. So I think my rule for dry cleaning is, if the fabric is heavy with structure that needs to be maintained, dry cleaning is the way to go. Silk is tricky because just being in water can cause shrinkage, especially fabric with a looser weave. I think ideally silk should be handwashed in the sink with as minimal time spent in water as possible. But - I am lazy and machine wash mine on the handwash cycle in a delicates bag. I use Dr. Bronner's because it's gentle, cheap, and smells good. Cardigan used to sell a soak wash that doesn't require rinsing, but I can't find it on their site anymore! Bummer, I would love to try it. Cashmere takes machine washing AMAZINGLY btw. I don't even bother with the delicates bag anymore, just wash inside out. I've read of people who throw it in the dryer too, but that's too far for me. And I agree with earlier posters, The Laundress has amazingly thorough washing tips (though I've never used their products). I don't own a dryer so that has never been an option. I too tend to stick to natural fibres and the cost of dry cleaning gets completely out of hand. All my tops are solids so I've never had an issue with running colours thankfully. One thing I cannot stress enough is the need to iron straight from wet for white/cream tops - it saves them from getting a yellowish tinge. I fetch mine out of the vinegar mix, wrap in a towel to remove the excess then pop straight on the ironing board - works a treat for all my Equipment blouses. And white vinegar makes a great fabric softener for towels too - keeps them fluffy without that weird chemical smell from supermarket-bought softeners, and is way cheaper! Oh and I also use it to clean my taupe suede boots, it returned my Marants to new after an unfortunate incident with a bumble-footed suitor on a rainy night. Just pop it on a non-fluffy cloth and gently wipe in a single direction - they went a scary colour and I thought I'd ruined them but by the next morning they were perfect! thanks for this post! your readers have so many great suggestions. might have to try a few. maybe i'm just gross, but i tend to wear my silks A LOT before dry cleaning. you know how they say a man's suit should be dry cleaned once per year? that's kind of how i roll with my silks. so, i will basically wear them for a year before dry cleaning them. i give them plenty of time to air out between wears, and rotate a lot. if it's washable silk, i wash it on delicate in a mesh bag with regular detergent, and i haven't had problems with that. I have always hand-washed silks (and everything else) in the sink and pretty much believe dry cleaning is just not good for most things. I use whatever hand soap we seem to have on hand (usually mrs meyers) and it seems to do the trick. I never dry clean anything unless it's something that I'm worried will cause color transfer. Even in that case when I've had things like that dry cleaned, the same thing happens when they are dry cleaned and color will run. Drives me crazy, some labels just don't set their colors well when dying! The only things that really need drying cleaning are certain kinds of printed textiles - I know some digitally printed silks really do need to be dry cleaned or the pattern might become splotchy when wet. 2. fabrics that have been treated with some kind of surface effect (like some metallic linens, the metallic bits will fade off when wet). But other than that it's perfectly okay to wash silk. Most knits seem to gain length when handwashing, so it's important to press the water out and lay them flat on a carpet when drying. The weight of the water can easily add 3-4" to your garment. Interesting post and a lovely blog - thank you! I usually wash my silk shirts in the washing machine on hand wash- program with gentle liquid detergent. I never dry clean anything except wool blazers etc. However, I have two kids and I do a lot of laundry so occasionally I have washed silk items (by mistake!) even in 60-90 degrees and surprisingly, after ironing they are as good as new! Also, I think a lot manufacturers tag clothes as "dry clean only" just to free themselves from any trouble... All best from Helsinki, Aino. Yesterday I was eating Indonesian food and I got some of that yummy bbq coconut sauce on my Saint James mariniere shirt. Not happy. Bright orange stain. I used the Tide pen. Didn't work. Then I tried a little bit of hydrogen peroxide and rubbed the stain with Palmolive dish soap with a q-tip. Wow! Stain disappeared! What steamer do you recommend? Thanks! Can Equipment blouses really be thrown in the washer to be washed? I'm afraid the color and quality might be ruined. I washed an oil stain on my everlane silk shirt as follow: The Laundress stain treatment then in the HE machine warm water + seventh generation detergent, hang dry: looks perfect, washed silk. I am washing my silk shirts from Everlane. The dry clean route was not removing smells and the washed silk look is nice. Have you had any issues with loosing the smooth/lustrous finish with this method? Maybe I am just not rinsing thoroughly enough to get all the soap out, but they come out more dull/rough. Thank you for this post! I am a year late to the game but needed this because I am sitting at my desk wearing, yet another, Blythe Jcrew silk top that shrunk from the dry cleaner. wtf. Hand washing from here on out. My everlane blouse shrunk massively after hand washing in cold water! So devastated. I was hoping I would buy more but was put off by this first trial. How does everyone avoid shrinkage? I just shrunk my everlane blouse by hand washing it in cold water. Was devastated as I had planned on buying loads more after this trial. How does everyone avoid shrinkage or do you always expect some and buy a size up? I would e-mail them and request a replacement. I've never had an issue with their silk shrinking.